Our Senior Girls team won another Championship Banner with an astounding 21 points (the lowest total of the six winning teams today). The girls were led across the finish line by soccer-rugby-wrestling-cross country-cross fit superstar athlete, Tea Racozzi ’19, as she powered her way to a second place finish. 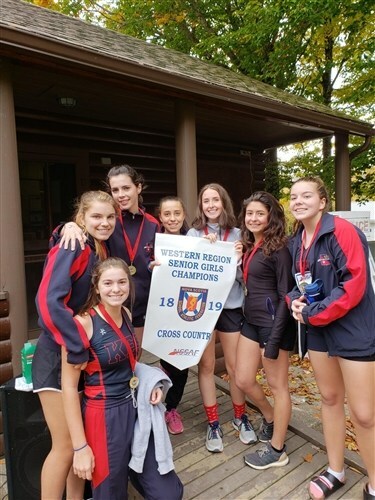 Eschewing her Intermediate girls 5km race and instead opting to run the 6km course with her teammates, Aria MacDonald ‘21 fought a grueling race all by herself in fourth place. Pushing each other through the race were seniors Lindsay Hogan ‘19 and Antonia Ziegler ‘19 with both young women having their best races for different reasons. One not wanting to pull in front of the other at the finish line, they crossed with hands clasped in unison - both in position 7.5, or so they tell me. Not so far behind were three rookies Teresa Musi ‘20, Madison Taljaard ‘20 and Kate Smith ‘19. Musi smiled each time I saw her, and had her best race of the season. Like MacDonald, Talijaard raced up to the Senior division and added a full kilometer to her suffering while running each hill without stopping. Smith had a great duel for nearly all of the race, until her racing partner cut the course by accident, or not, and ended up an intractable distance ahead. However, displaying the best of sportsmanlike behavior, it didn’t bother our Kate, didn’t affect the standings, and that was that - she chose to think that her competitor made an honest mistake. In the Junior girls 4km distance, rookie Jenny Zhang ‘23 showed her best improvement of the season and made the rest of her KES teammates proud by representing herself most honourably in running her best. The Seniors were led by Grade 12 student, Luis Espinosa ’19, who battled to a 4th place individual finish. Battling his best and gaining experience in his second race and placing second on our team was Keegan Gilbert ‘20. Close behind was Edward He ‘21 as he ran a much better front half than his previous efforts. Our fourth scoring runner was rookie and sprinter, Andrew Atwood ‘20, who was just steps ahead of rookie and foodie extraordinaire, David McCurdy ‘19 who was trying his best to be just steps ahead. Though they pushed and pulled one another, there were no holding hands across the finish line in this race. Gavin Liu ‘20 had a greatly paced first two laps while waiting for the third that never appeared. Third year cross country runner and Senior, Spencer Lockyer ’19, ran an evenly paced race before coming up to speed for a bit of a sprint finish. 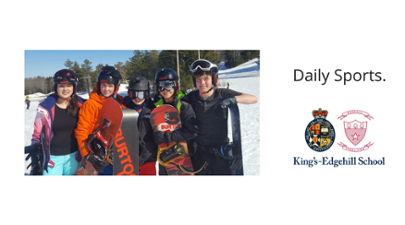 Our boys’ team ended up just one point off the podium in fourth place, and I’m sure that they want to improve on a couple of tactical misjudgments next weekend in Cheticamp. Though I know Sarah Lynch ‘19 and Amelia Humphrey ‘19 would have liked to have been, deservedly, on the podium, they were unable to race today and, over the season, have undoubtedly contributed to their team capturing another Championship Banner. Thank you. 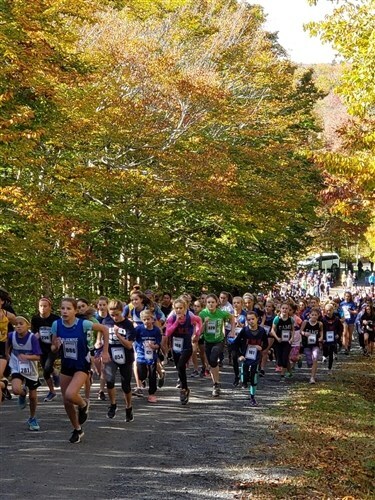 This coming weekend our seven Senior girls and seven Senior boys will run in Cheticamp, Cape Breton, to do their best against the best of Nova Scotia at the Provincial Championships. Thank you to head Soccer coach, Meghan Keoughan, to our Hockey head coach, Brian Casey, our head coach of Boys’ Soccer, Sven Dietrich, and our head coach of Girls’ Hockey, Isabelle Germain,for the continued support of our programme. In so many ways we are the UNited KES team of athletics. A special thank you to our Athletic Director, Kim Walsh, for all his support and patience (One day, Kim, I’ll get better at picking up banners - pinkie finger promise!). We want every child to find an activity he or she can pursue with passion. With three seasons of sports and over 25 different options to choose from, we are pretty sure your child will find a few to love. Download our Athletics Photojournal.